Photo Liz Lauren, courtesy Chicago Shakespeare Theater. "Delivers fun to die for... the Kinosian-Blair score is a deft pastiche. And the rip-roaring, four hands piano fireworks of the finale is absolutely terrific. It is, indeed, a "killer musical." "This infectious new musical murder mystery comedy could get belly laughs from a corpse. ...Irresistibly infectious, old-fashioned fun. ...Murder should slay even the most jaded party guests." "By far one of the funniest little productions to come around in years! ...What an evening of entertainment. 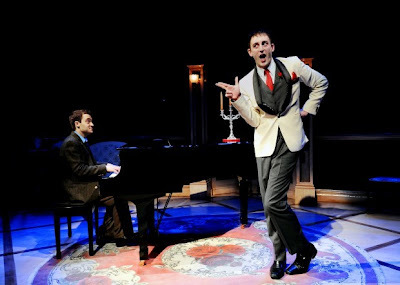 ...This is a musical farce with music that will remind you of Sondheim and comic touches that are both burlesque and vaudeville and could easily be equated with the Marx Brothers. ...There is nothing but release of any stress you may have from watching this comic masterpiece -- one that I am sure will be done for years to come in theaters all over the world. ...From start to finish, every little detail is sheer perfection." 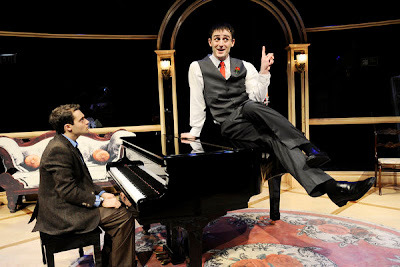 "Either dueling it out on the piano or working the sketch-like comedy, Kinosian and Schmuckler have an old-fashion show biz partnership quality." "If you want an evening filled with laughter, claim your seat for Chicago Shakespeare Theater's production of Murder For Two - A Killer Musical. This musical is zany and madcap in the tradition of some of Hollywood's best screwball comedies of the 1930s and '40s. ...A very talented young man, Kinosian performs equally well in the roles of actor, comedian, pianist, composer, and writer. ...Musical comedy is back with a bang in this very entertaining and funny production with some memorable tunes that you may just find yourself humming as you leave the theater." "The surefire funny small stage comedy of the summer has hit Chicago. ...It's a not-to-be-missed, just under two-hour, funny romp created by the combined young entertainment genius of Joe Kinosian and Kellen Blair. 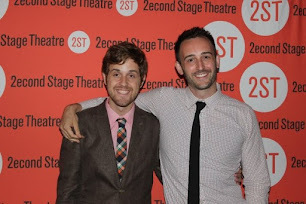 ...It's the show's co-creator Joe Kinosian who takes the audiences to new levels of funny never expected." "This 90-minute concoction/confection combines sassy showbiz savvy, tons of moxie, rapid-fire character switcheroos, and the wizard piano stylings of Chico Marx and Victor Borge to unleash a bravura showcase for Kinosian and Alan Schmuckler. ...Prosecuting this charming nonsense are ten winning songs, several of which could easily stand on their own outside the show." "The straight-man/funny-man combo works wonders here, with Schmuckler's earnestness giving Kinosian free rein to send his characters over the top and director David H. Bell has instilled this world premiere with a sense of excitement and experimentation throughout that caters to the show's irreverent strengths. ...Those looking for a laugh will be more than satisfied." "About as giddy and lighthearted as you can get short of climbing into a hermetically sealed, helium-filled bubble. ...A laff riot... the comedy is spectacularly well executed. ...The lunacy reaches size XXL Crazypants." "It is easy to apply the adjectives brilliant, creative, and imaginative to Chicago Shakespeare Theater's premiere of Murder for Two - A Killer Musical. ...A marriage between Victor Borge and Agatha Christie with a mixture of the Marx Brothers thrown in." Check out "Murder For Two" at Chicago Shakespeare, extended thru Sept 4!